These are adorable.... hot chocolate on a stick. For a tutorial click here on Giverslog. Maybe it's too overwhelming to think about right now... maybe not... these would be cute even for valentines for your sweetheart. Or just for kids for afternoon snacking delight! 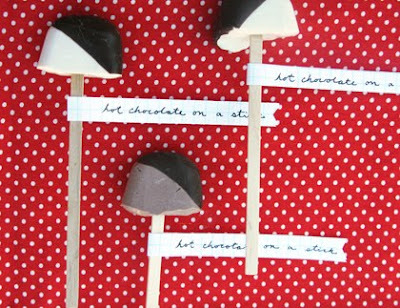 You add these cute little chocolate "POP'S" to a warm cup of milk and ta-da!